Commercial bumble bees have a lifestyle and foraging behavior that is fitting for greenhouse operations. This commercial bumble bee colony is deployed in a greenhouse in Saginaw, Michigan. They will last up to 12 weeks and require minimal management except for being placed off the ground and shaded. 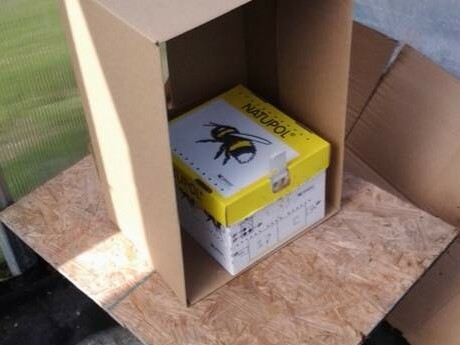 Inside each colony is a pre-packaged sugar water source to keep bees fed when flowers are unavailable or when sprays are applied, but be proactive about closing the entrance before spraying insecticides. Photo by Ben Phillips, MSU Extension. 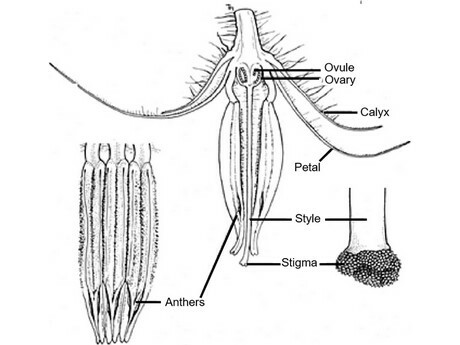 The tomato, pepper and eggplant flower has a female part (stigma) surrounded by a cone of male parts (anthers). These flowers usually hang upside down and when agitated will funnel pollen from the male part down through the cone and onto the female part. Bumble bees can enhance this pollen transfer. Image modified from McGregor, 1976. Beans have complicated flowers that require bees to learn how to access them. They are mostly self-pollinating, and bees may work them if nothing else is available. Image modified from McGregor, 1976. Other factors that can impact pollinator foraging behavior are air flow and CO2 concentrations. Air flow can indirectly impact foraging behavior of bees by influencing the direction in which they fly. All flying species prefer to take off into the wind. Placing boxes in an area facing an on-coming breeze and facing the target crop can make their colony exits more efficient. CO2 concentrations have a debatable impact on pollinator behavior by impacting the growth characteristics of crop plants. In some cases, higher levels of CO2 above 350 ppm increased nectar volume, flower number or flower bloom longevity. Therefore, if bloom number, longevity or nutrition increases, then bees would likely be positively impacted. 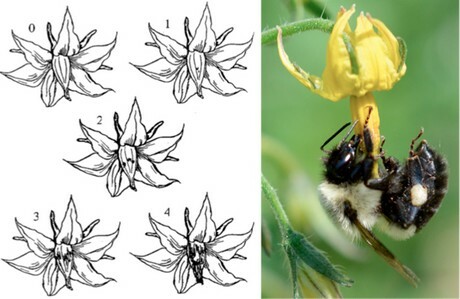 Bumble bees grasp tomato flowers with their mandibles as they buzz pollinate. Their visits to tomato flowers can be estimated by the bruising on the stamen cone. From 0 to 4, the amount of bruising increases in this illustration, which indicates multiple visits. 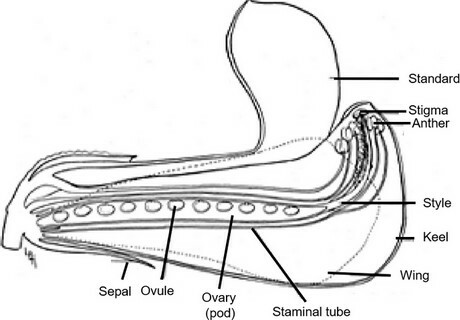 Left picture from Morandin et al 2001. Right picture from Tim Stanley/Native Beeology.